The inspection software ThomControl is very easy to use. ThomControl has an extensive graphical support and allows even inexperienced operators after a few days the efficient and time saving inspection. Teach-In measurement programs can be learned by using the joystick. 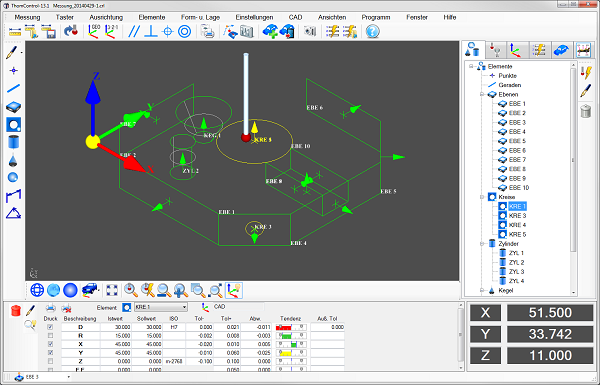 If the operator works with a CAD model, the features can be selected via the CAD file with a mouse click and automatically measured. 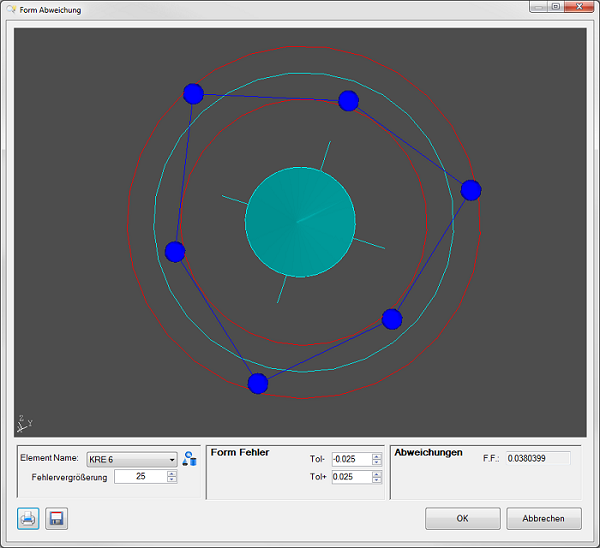 ThomControl inspection software generates the measurement program automatically in the background. 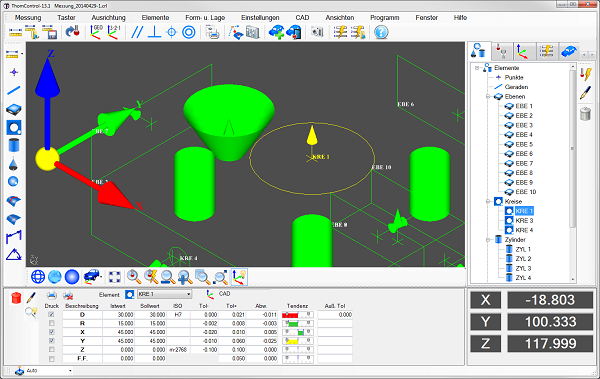 For all features comfortable CNC probing strategies are available, which are displayed visually and can be configured as required. ThomControl based on the I++ DME communication standard and can be used with all the hardware components that support this interface. Therefore modernization (RETROFIT) of old CMM´s from any manufacturer is cost effective possible. The following description of these 3 main levels of ThomControl gives you a quick overview of the main features of this modern measurement software. Simple, intuitive operation with graphical support through a clear user interface. Easily create alignments with the 3-2-1-alignment or the Geometric alignment respectively with graphic preview. The nominal values of the elements can be entered in clear windows and then be automatically measured via a displayed CNC measuring strategy. A tolerance database with the ISO tolerances according to DIN ISO 286 is available. The measurement results are displayed directly in the result window with graphical trend bars. Comprehensive form and position evaluations such as parallelism, perpendicularity, concentricity, position, flatness, straightness, etc. are available. Measuring programs can be easily created and very easily changed by double clicking on the program line. Both CNC and manual measurement programs can be generated. All measurement results are stored and are available again at any time. In addition to the internal file format of THOMControl the measurement reports can also be saved in Word, Excel and PDF. 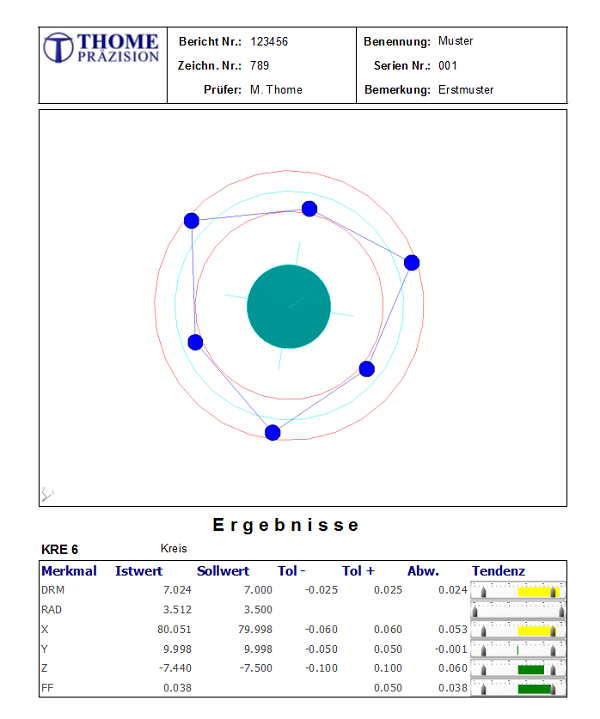 The measurement reports are easy to adapt to your layout requirements. Several standard report templates are included. Various constructions of geometric elements allow extensive calculations of theoretical dimensions. All items are displayed graphically in 3D and can be printed graphically, for better interpretation of the measurement results. Measurement of all standard geometric entities: POINT, PLANE, LINE, CIRCLE, SPHERE,CYLINDER, CONE, without any need for CAD/CAM data. Constructions of geometric and user defined entities: BESTFIT, INTERSECT, MIDFEAT, PERPENDICULAR, PARELLEL, PROJECT, MOVE. GD&T Tolerance and Report Generation: All geometric FORMS, DISTANCE, ANGLE, PARALLELISM, PERPENDICULARITY, ANGULARITY, TRUE POSITION, RUNOUT. Alignment options: Geometrical Alignment, 3-2-1-Alignment, TRANSLATE, ROTATE. Probe Calibrations: Automatic probe calibrations, for fixed or indexable probe heads. Easy Teach part programs in an easy language. Programming window in TREE view. Generate inspection reports automatically with text and graphics. Save inspection programs, inspection projects and measured data. 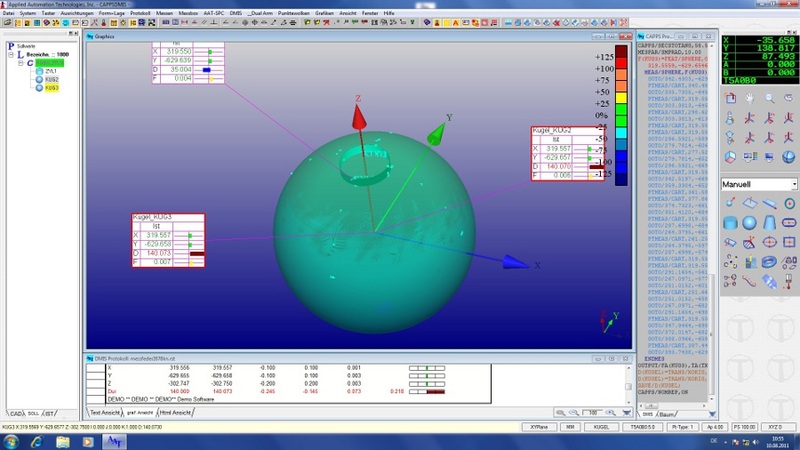 3D graphical display of all measured and nominal features. Real time display of PROBE, Coordinate Systems. Graphical User Interface includes menus and toolbars. 3D graphics interface with easy to use short keys and toolbars. ThomControl inspection software can be updated at any time to higher level which includes CAD Interfaces or other options. Measurement of all standard geometric entities: POINT, PLANE, LINE, CIRCLE, SPHERE, CYLINDER, CONE. GD&T Tolerance and Report Generation: All geometric FORMS, DISTANCE, ANGLE, PARALLELISM, PERPENDICULARITY, ANGULARITY, TRUE POSITION, PROFILE, RUNOUT. Alignment options: SETUP, TRANSLATE, ROTATE, MIRROR, SAVE, RECALL. Advanced alignment options: MGP, Simple 3-2-1 alignment macro for fixtureless parts. Import Wire-Frame CAD models from IGES and STEP: Wire frame, surface or Solid models. Programming window in DMIS or TREE view. 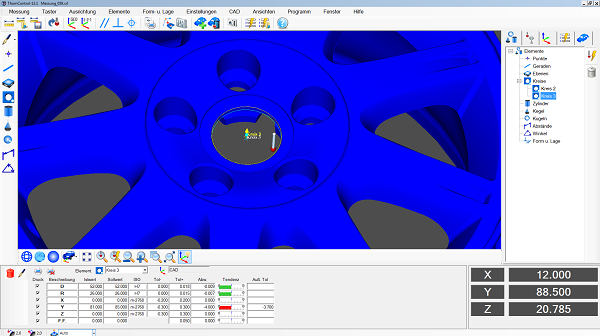 Advanced Nominal Data extraction for geometrical features from wire-frame only. 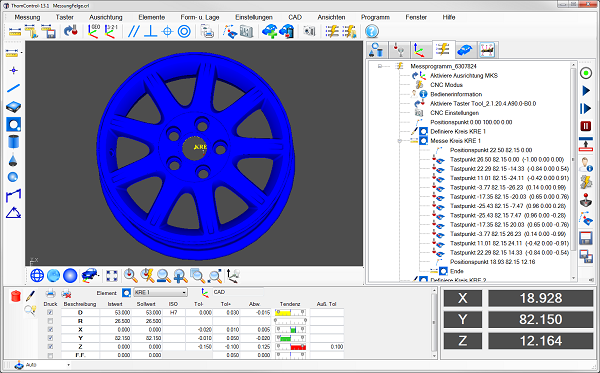 Easy CAD-translation in ThomControl with a choice of different levels of shading quality. Automatic measurement in Learn Mode. Create nominal probe calibration commands and Create measuring programs to automate Master Ball Measurement and Probe Calibration Routine. EXCEL , WORD and PDF report files. The alignment over 6 surface points and the best-fit alignment are available for fast and accurate alignment against a CAD-part. The measurement of sections can be simply done by clicking start and end point. The point density can be adjusted individually. Surface shapes can be measured using automatically generated grid of points. Line- and surface shape tolerances are calculated and displayed graphically. Measurement of all standard geometric entities: POINT, PLANE, LINE, CIRCLE, SPHERE, CYLINDER, CONE, SECTIONS, CURVES, SURFACES. GD&T Tolerance and Report Generation: All geometric FORMS, DISTANCE, ANGLE, PARALLELISM, PERPENDICULARITY, ANGULARITY, TRUE POSITION, PROFILE, RUNOUT, SYMMETRY. 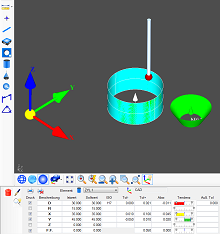 Sheet metal relative measurement commands, hole search and locate options. Vector build and automatic path correction. Material thickness, part shrinkage options. Create surface sections by cutting surface at body lines. Grid Points Generation of U-V lines on surfaces. Alignment options:GEOMETRY ALIGNMENT, 3-2-1-ALIGNMENT, TRANSLATE, ROTATE, MIRROR, SAVE, RECALL. Advanced alignment options: MGP, 3-2-1, 3D Bestfit. Automatic probe calibrations, for fixed or index able probe heads. Support for MCR, SCR, FCR, ACR tool changers using tool/tip changer option. 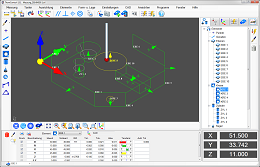 Import CAD models from IGES and STEP: Wire frame, surface or Solid models. Teach part programs from CAD..
Measure 2D features automatically by graphically adjusting measurement parameters. Measure-CAD: Automatic measurement in Learn Mode. Graphical report generation with templates. ThomControl features extremely simple operation and the highest ease of use. Extensive graphic support allows even inexperienced users to measure in an efficient and time-saving manner after a few days. In line with the motto "Click and Control", you just need to click on interactive elements on the screen. 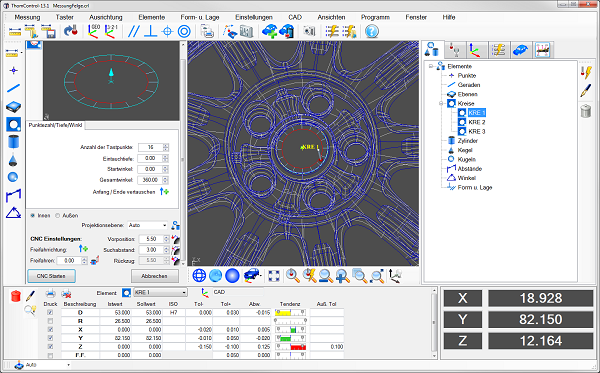 The CNC Program is automatically created in the background. The alignment of the workpiece can already be done through one probe point. 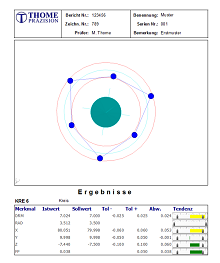 However, for an exact alignment, 6 probe points are needed. Different alignment methods can be applied (1 point, fixture, geometric, 6 surface points, through 3 central points, through plane and 2 central points, best fit, and the RPS alignment). For the most important geometric elements, automatic probing strategies are available (point, straight line, circle, radius, plane, sphere, cone, torus, surface points, section, rectangle, oblong hole, ellipse, and hexagon). Safety cubes, which can be formed around the workpiece, offer protection from collision. All traverse paths and probe points are displayed in advance. Thus, the user can recognize the influence of different probing strategies online. Any number of criteria can be calculated from the measurement results (angle, distances, shape and position tolerances, section, mirror, and symmetry elements, etc.). The following shape and position tolerances are available: straightness, evenness, roundness, cylindricity, surface form, parallelism, rectangularity, angularity, position tolerance, coaxiality, concentricity, symmetry, true running). 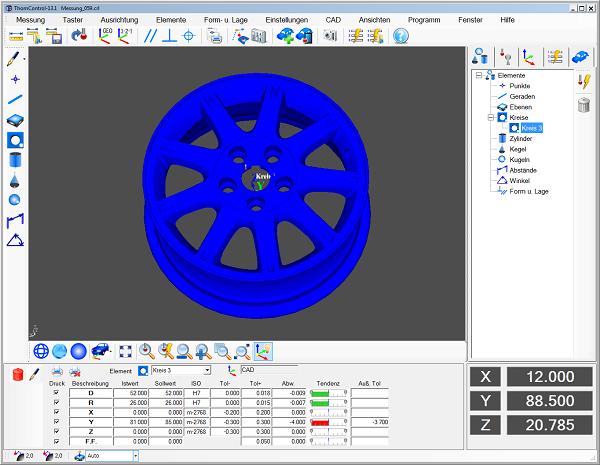 All common CAD formats can be imported into the software (CATIA; CATIA-V5; UNIGRAPHICS; PARASOLID; PRO/ENGINEER; IDEAS; VDA; IGES; STEP; SET; UNISURF). 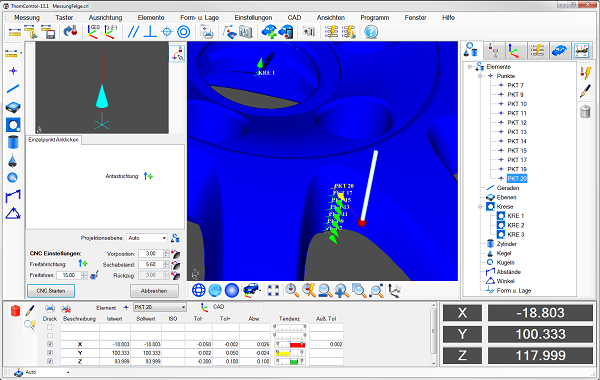 This facilitates programming and enables a fast direct CAD comparison of the nominal and actual contour. Extensive strategies are available for the quick measuring of surface points. Thus, e.g., entire point aggregates can be generated with just 3 clicks. In order to examine contour runs, sections can be measured according to different criteria. Likewise, it is possible to digitalize an unknown contour through an integrated scanning function (reverse engineering). A clearly arranged database helps you to easily manage your measuring results. It contains a wealth of search and sorting criteria. The internal statistics module calculates the most important parameters for process monitoring for you (Cp, Cpk, standard deviation, mean value, etc.). For the graphic presentation of the measuring result "color mapping" is available, among other things. Thus, a colored "error map" is generated so that the worker can rework in a specific way. The easy interpretation helps to save time and to avoid errors. With the help of labeling fields you can create modern, meaningful logs. Measuring logs can be displayed in graphic form, in table form, or in graphic/table form. A powerful log editor enables the quick adjustment of print copies according to your individual needs. Measuring logs can also be generated in JPG, BMP, WMF, and PDF form. Thus, data exchange via the Internet or, respectively, paperless documentation is possible. With the "F1" button you can access the online help. Extensive explanations also explain background knowledge about the most common standards to the user. Many other modules are available, such as, e.g., workpiece temperature compensation and offline programming. We would be pleased to demonstrate the service capabilities of our systems to you in our facility. With optical laser scanners workpieces can be digitalized conveniently and quickly. Particularly beneficial is the high dot density of about 20,000 dots per second that can be recorded. The laser scanner can be exchanged automatically in connection with a probe changer magazine. This enables the parallel use of touch and optical sensors. The accuracy of the stripe laser is about 10 - 20 µm.